Neven: I know this goes back almost a year but I found the information you posted here to be quite interesting. It seems the Karakorum range glaciers are keeping close to equilibrium, with no significant loss of mass balance. The time lapse of the Baltoro glacier was great. Animated glacier images, that must be a something really new ? Quite! Still in the development stage, I guess. On July 17, 2016, a huge stream of ice and rock tumbled down a narrow valley in the Aru Range of Tibet. When the ice stopped moving, it had spread a 30-meter-thick pile of debris across 10 square kilometers. Nine people, 350 sheep, and 110 yaks in the remote village of Dungru were killed during the avalanche. The massive debris field makes this one of the largest ice avalanches ever recorded. 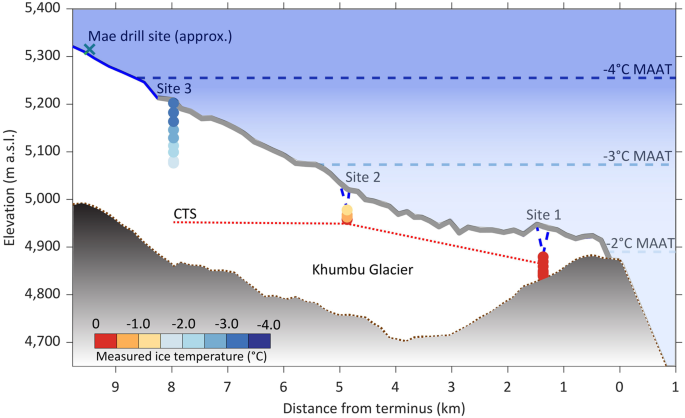 The only event of a comparable size was a 2002 avalanche from Kolka Glacier in in the Caucasus , explained Andreas Kääb, a glaciologist at the University of Oslo. A multispectral imager on the European Space Agency’s Sentinel-2 satellite captured an image of the debris field on July 21, 2016. The Operational Land Imager, a similar instrument on Landsat 8, acquired an image on June 24, 2016, that shows the same area before the avalanche. Skanky, great post! I think the Aru mountains are in the northern part of the Tibetan plateau. That glacier must have lost more than half its mass in the avalanche. What's worrying for me is that this mechanism might apply to much larger glaciers, such as those comprising the Greenland ice sheet. That would create a rather sudden change in sea level, probably with a decent sized tidal wave. Rox, check out this link. On a limited scale it does address your question. It took a while after skankys post for me to make the connection, but some while ago I read an article about how in the Alps[Swiss] the north face of some mountains which had been assumed to be solid rock were actually being held together by long frozen ice. As the ice thawed whole rock faces collapsed, is that what we're seeing here? "Nepal drains dangerous Everest lake". "Nepal army says it has finished draining a dangerous glacial lake near Mt. Everest to a safe level". Interesting. The scale of the problem is huge: Imja is one of thousands of glacial lakes in the Himalayas. Work on building the outlet took six months under tough conditions, and water release took 2 more months. They now plan to replicate the process to other glacial lakes. I am guessing budget constraints will prevent a complete fix to all lakes at risk, as happens in most places (levees, seawalls, etc.). Noah's ark, Gilgamesh's epic, the lost city of Atlantis, they could have been victims of glacial lake melt at the beginning of the Holocene. It the arctic did become ice free, it would have warmed the planet very fast, which would have melt the enormous glaciers in the northern hemisphere and cause flooding much worse that we see this year. I wonder how the world population was affected during those events. Atlantis is not considered a historical account. Noah's ark (like many biblical tales) is derived from other near east flood myths, possibly with a bit of history in them but not necessarily. If these myths are historical, they may derive from the flooding of both the Persian Gulf (and the southern end of Mesopotamian settlements) and the Black Sea (and the northern end of Anatolian settlements) around 6000 BC. A glacial melt lake is most probably not the reason for these myths. The way I look at it, there have been many lost cities of Atlantis, many Noahs and many Gilgamesh over time. I'm pretty sure that as the world warmed at the beginning of the Holocene and the last remaining glaciers disappeared, many human coastal settlements were lost, some of them relatively advanced for their time. It can happen very fast. For example, if the arctic sea ice did disappear at the beginning of the Holocene, then temperatures would have shot up quite a bit melting glaciers at a much faster rate than today. I Imagine that water vapor would have increased too. That could have caused great floods that no human alive has ever seen. Also a high tide after a year with particularly fast glacier melt, could completely submerge vulnerable ancient coastal civilizations. These events stayed on the collective memory of humanity in the form of Atlantis, Noah and Gilgamesh. I don't think we will see these events at the scale of early Holocene simply because there is much less ice today that there was then. You're probably right Archimid, although the collapse of the West Antarctic Ice Sheet would raise sea levels significantly. Karakoram Vortex sounds like a good band name. Publishing their findings today in Nature Climate Change, the team from Newcastle University, UK, have identified a large scale circulation system – or vortex – centred over the Karakoram, a large mountain range spanning the borders of Pakistan, India, and China.